At Bus Hire, we make it a point to offer convenience and comfort to people with our Southbank Bus Charter service. If you are looking to discover the Southbank in Melbourne, you wouldn’t find a better choice than our wide array of options, offering the most convenient way of commuting for groups of all sizes. Southbank is an urban neighbourhood of Melbourne, roughly a km towards the south of Melbourne CBD. Its southernmost region is considered portion of the Central Activities District and the Central Business District of the city. The area is bordered by St Kilda Road to the east and Yarra River to the north. It was originally formed as a part of South Melbourne, being an industrial area, and it transformed into a populated district beginning in the early 90s. There is certainly no doubt it is one of the most densely populated regions in Melbourne, with a large bunch of apartment towers, including the tallest tower in Australia, the Eureka Tower! Also known as the Crown Casino And Entertainment Complex, the Crown Melbourne is a resort and a casino located on the southern banks of the Yarra River, which was initially opened on the northern bank. It remains one of the key features of the Southbank zone of the Melbourne CBD. The humongous space of the entire complex is equal to a couple of city blocks, making it one of the largest complexes in the world and the largest in Southern Hemisphere. The complex also houses Crown Metropol, Crown Promenade and Crown Towers Hotel. Located in the Southbank precinct of the Melbourne city, Eureka Tower is a skyscraper that was officially opened in October 2006. The project was built by Grocon, after it was designed by an architecture firm Fender Katsalidis Architects. At the time of its construction, it was the tallest residential tower in the world, until the record was broken by HHHR tower and Ocean Heights in Dubai. It is the tallest to roof and the 2nd tallest building in Australia, behind Q1. The tower got its name after a revolt during the Victorian gold rush in the year 1854, called as Eureka Stockade. This has been included in the design with the gold crown of the building depicting the gold rush and red stripes depicting the blood split during the rebellion. The white line covering the building represents the flag, while the blue glass cladding also represents the bluish background of the stockade’s flag. The most visited and the largest art museum in Australia, the National Gallery of Victoria was founded in the year 1861. It houses a wide assortment of art collection across a couple of sites, including Ian Potter Centre and Melbourne Arts Precinct. Housing an international art collection of the gallery, the place is on Victorian Heritage Register. The Australian art collection is housed in the Ian Potter Centre that was designed by Lab Architecture Studio. Opened in the year 1984, the State Theatre is a part of Arts Centre Melbourne located by the St Kilda Road and the Yarra River. With one of the largest stages in the world, the State theatre has an underground performance venue, which is typically utilised for musical theatre, opera and ballet. Having presented 7 or 8 operas each season, Opera Australia is a key part of the State theatre. The first opera conducted here was that of John Copley, in 1984. It is also home to a theatre entity, The Production Company specialising in short season resurgence of Broadway Musicals. It is also a performing venue for Australian Ballet. You cannot find a better 21st century live music hub, other than the Melbourne Recital Centre. It celebrates the past, by imagining the future and welcoming the present, a place where audiences and artists are invited to explore, challenge and engage. Tons of concerts are held each year, with focus on music, displaying the peak of art form as practised by international and Australian performers in a sparkling diverse range of styles, from post-rock to early music. People of all ages and abilities can come and experience amazing performances. The centre has been home to a lively community of national and Victorian music ensembles, and is a popular venue for acclaimed companies, including Victorian Opera, Musica Viva, Melbourne Symphony Orchestra, Melbourne International Jazz Festival, Melbourne Chamber Orchestra, Australian String Quartet, Australian National Academy of Music and Australian Chamber Orchestra. The Ponyfish Island moving under the Pedestrian Bridge in Southbank is a paradise for wanderers and wonderers. If you have hunger for something new, this is the place to savour drinks and thoughtful bites. The name of the island has been taken from a mysterious creature, named as Ponyfish, which was spotted swimming in the Yarra River. It is a debatable topic whether someone has fabricated this creation with a belief, or something like this actually exists. It’s a great place for some adventure, and the explorers are welcome to discover the area! Featuring a riverside bar and barbecue, along with a restaurant and a cocktail lounge on the banks of the Yarra river, the Ludlow Bar & Dining Room has a contemporary feel to it, incorporating recycled timber, stone and raw steel to create an inviting atmosphere. The daily changing menu is primarily focussed on Mediterranean cuisine, along with an eclectic wine list, as well as cocktail list, specialising in local wineries. Book Cheap Southbank Bus Charter with Us Today! Are you planning for a family trip to the suburb of Southbank in Brisbane? Nothing can beat the thrill and excitement of travelling in a big group to different places. You are not only saved from the trouble of navigating your own way, but will also save a lot of expenses on hiring cabs or cars. 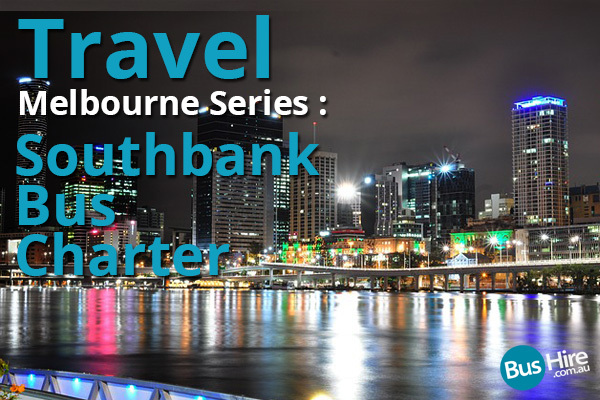 Bus charter in Southbank is provided at a reasonable cost, making it both comfortable and convenient for the commuters.